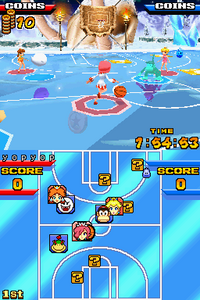 Sherbet Land is a court found in Mario Hoops 3-on-3. It is the first court played on in the Rainbow Tourney. The entire court is frozen, giving very little traction. Players will slip and fall if they attempt to steal the ball while running. An item exclusive to this court is the Freezie. When picked up and thrown, the Freezie will slide along the court until it either hits a player or bounces off two walls. If a player is hit, they are frozen in a pillar of ice for several seconds. If no one is hit before the Freezie hits two walls, it will simply shatter. This page was last edited on July 2, 2018, at 14:52.